Lando Calrissian: Show me your teeth! When today's toy manufacturers launch a new action figure with myriad variations it's hard not to smile ruefully and picture the board meeting in which that decision was made and to hear the Kerching! of the cash register ringing in one's head as collectors scramble to add every version to their set. It's fun, therefore, to look back at vintage action figures with genuine oddities or variations depending on their country of origin or for reasons which are hard to explain. 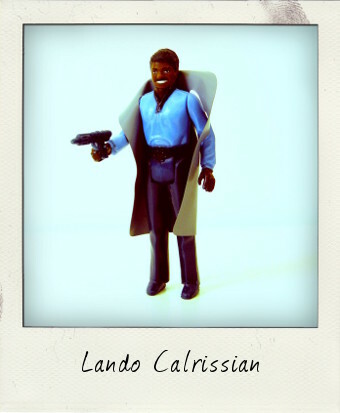 Kenner's Star Wars action figures practically invented band wagon film tie-in merchandising and this smiling Lando Calrissian is an excellent example of the variations out there. Lando Calrissian, the card playing gambler and smuggler friend of Han Solo, eventually becomes one of the original trilogy's heroes and this figure was released in 1980 to coincide with his first appearance in The Empire Strikes Back. 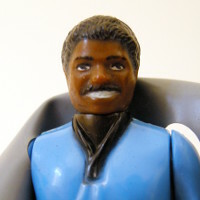 The "smiling" version or "white teeth" variety shown here is actually a pretty good likeness of actor Billy Dee Williams who played him in the movies – more so than the alternative issue of this figure which Kenner released at the same time, the "non-smiling" or "no teeth" version. My Lando comes with his original cape, albeit slightly torn under the armpit, as well as his blue Bespin blaster weapon and is in very good condition bar a little paint wear on his gun hand (a common play injury!) In addition to the very obvious full set of dazzling choppers, there are a couple of minor curiosities to note with this figure too. The skin colour on his neck is considerably darker to that of his face and the copyright information is spread over two legs, with China, the country of origin, stamped on a raised bar on the back of his left leg and the date and L.F.L. 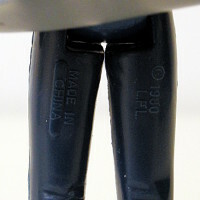 (Lucas Film Ltd) stamped on the right leg. A welcome addition to the Star Wars collection!